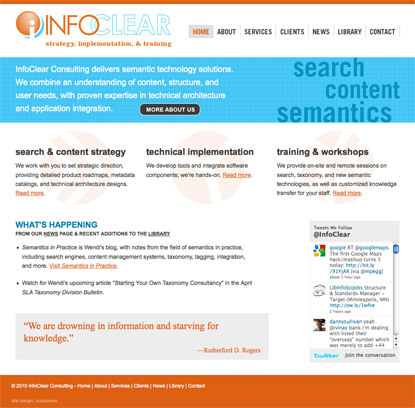 One of the recent projects we've completed is a new website for InfoClear Consulting, who offer search and content strategy, and semantic technology implementation. InfoClear Consulting is Wendi Pohs and Michael Kilgore, and although we haven't all yet met in person (they're based in Issaquah, which is part of the Seattle-metro area), I can speak from our experience that they're great to work with. What they do is actually related to the information architecture consulting work I've done in the past—and still do. But, in many ways, their work is "the future" that I had glimpses of back in the 1990s when I worked as a "digital librarian." They are working with cutting edge search and content organization systems to make vast amounts of digital information findable and available to the people who need it—e.g., in the enterprise. Part of what was fun working with Wendi and Mike is that they had a desire to have their site reflect their own enthusiasm and passion for the work they do. And, they didn't want the site to fall prey to that dryness / blandness that is something of a standard for websites about enterprise information strategy in general, and search / semantic technology in particular. So, it was great for us to be able to design a site that was first of all going to be a communication of Wendi and Mike's vibrancy as professionals in this field. This then created a context where we could include all kinds of facts and comments about their work, but have it inherit that energy in the design. Yes, they do have a list on the website of the Taxonomy Tools that they work with, but I think we all found a way to give that list a context that makes for a web experience that is simultaneously straightforward and enjoyable.